Wee Stalin was completely offended lol. 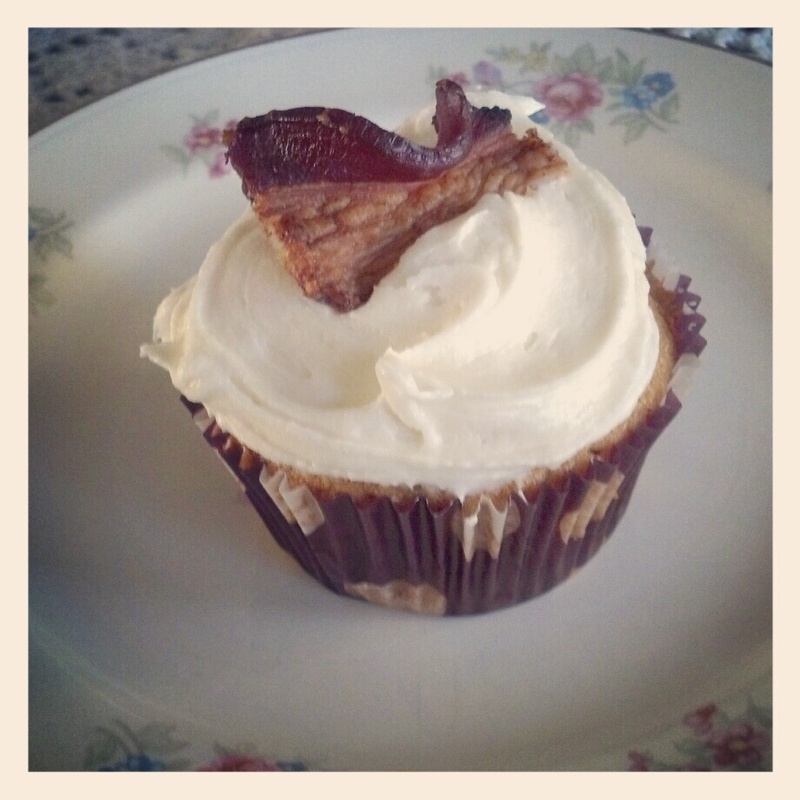 I think this may have been due to the piece of bacon that garnished the top in her frosting. She just felt it was wrong i guess. Queen B loved them but felt the cream cheese frosting wasn't quite a right fit and maybe next time we should try something different. The Gypsy Prince sadly was still so ill with the flu he couldn't manage to even try; much to his disappointment :( And the railroader was smitten at first bite! I myself am still on the fence, just not quite sure what to think of the collision of flavors. They remind me of a sweet cornbread and I think I have to agree with Queen B, the cream cheese frosting is not a good fit. If I make them again I will use the frosting called for and I think find a really good quality bacon to use. I think that might amp the flavor a bit. Also, I got 12 standard size muffins out instead of the 6-8 it says without increasing anything. All in all, not a complete fail and I added vanilla garlic to my reader because it truly is a fantastic blog. I really like his writing style and sense of humor. Not to mention there are other recipes that I plan on trying like this garlic bread, yummmmmm. You have to read the post, it's great. Stories on being a poor college student and ramen noodles. Hilarious and thought provoking. Im sure everyone can relate to the early culinary years when money was tight and the need to be creative. What have you been cooking up lately? Im always up for a new recipe if you want to share!